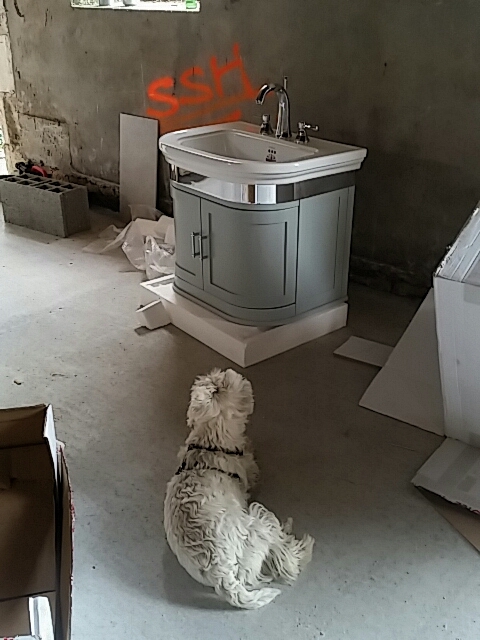 That’s Jacques, gazing upon the magnificence that will be the apartment sink. It looks good, I think, even sitting in the garage without its legs. If only we could get those pretty curved doors to open. Some crazy client — no names, please, this is no time to point fingers — saw an 85 cm space and thought a 60 cm cabinet would fit just fine there. This assumption being correct until you try to open the curved doors. Oops. We don’t have 5 weeks for a do – over, so we’re going to go with this for now. If I ever put a rental in the barn, we could see it as a relocation opportunity. I grew up pretty white trash, so for me, if you can wash in it and it has plumbing, it’s a sink. I do like the idea of a washbasin. It has that vibe, doesn’t it? Glad you like it. Thanks. Glad you like it. We have come a long way, haven’t we? I have a theory that our backgrounds made us better risk – takers than we might have been. Or maybe we were that way to begin with, which is how we got off those mean streets in the first place. Beautiful! I’m glad I’m not the only person who doesn’t notice details like that when I’m choosing stuff for the house. What type of space is it supposed to fit into? could the depth of the cupboards /recess on either side be reduced to allow the doors to open? Otherwise you should be able to return it – most French stores accept returns. Augh! Rogue app! Anyway, I bet I wouldn’t get the new item until October, two guests from now. Will they accept used returns? It goes into a spot with a wall on one side and a curved shower door on the other. Maybe when the shower door is open? Maybe just a little? Enough for a hair dryer and some toilet paper? We shall see. Roger, I just picked up your photos from the framer. They look so good that I’m afraid to show them to you. You’ll raise your prices!